Ms. Evelyn Tolinero is your tourguide on the sailboat „Misty Morning“ The only sailing woman in a men- dominated business in Boracay. Our Tour guide will meet you prior to sailing, to help chose the sailing routes, according to the weatherreport. 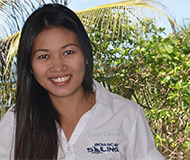 She will help to communicate with locals on your island hopping trip, and arrange that all will be set for your wellbeing during the whole trip. A "Free service" of "Boracay Sailing" You will have of the most exiting guided tours by sailboat.